This paleo apple crisp recipe combines warm rich spiced apples with a crispy crumbly nutty cinnamon topping. It's the perfect fall or winter dessert that is also gluten free and vegan. This paleo apple crisp recipe combines warm rich spiced apples with a crispy crumbly nutty cinnamon topping. It’s the perfect fall or winter dessert that is also gluten free and vegan. Fall has arrived and with it comes cravings for warm, sweet foods that use seasonal ingredients. 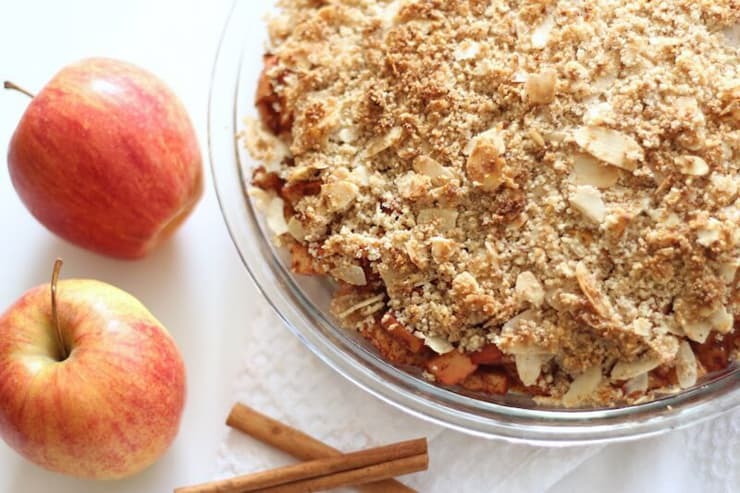 What’s more seasonal than a paleo apple crisp recipe? 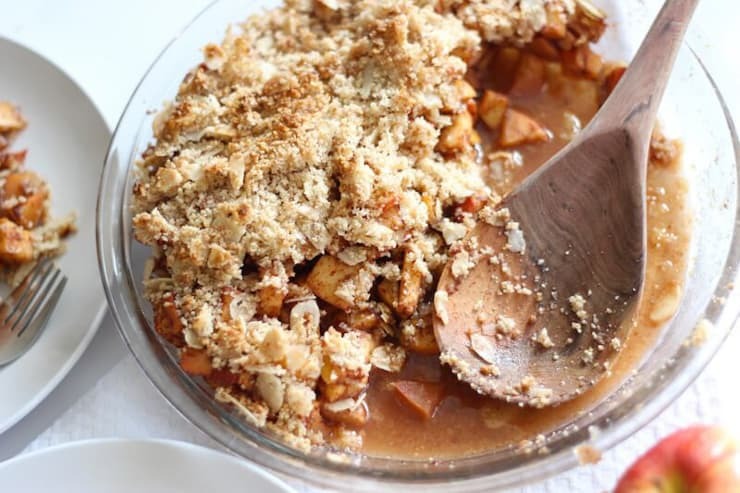 This one is even more special because it is a bit healthier than the regular apple crisp recipes because it’s paleo, gluten free, vegan, dairy free and uses natural sweeteners. And it’s a pretty easy crumble to make too! This paleo apple crisp is pretty easy to make and doesn’t involve any special baking skills like rolling out dough or rising yeast. Even if you don’t get the amounts quite exact this recipe will usually still come out tasting delicious! This crisp is healthier than the usual store-bought ones. It uses healthier flours and sweeteners and only contains about 2 tbsp of natural coconut sugar per serving. If you are craving warm seasonal spiced treats for fall or winter holidays, this is the perfect dish. Serve it for a fall dinner party or for thanksgiving! 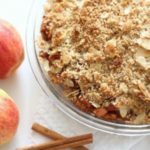 This paleo apple crisp is a versatile recipe– not only is it a great dessert dish, but it can also double as a breakfast or brunch dish. When it comes to selecting the type of apples to use for this recipe I prefer to use apples like fuji, pink lady or gala. They tend to have a firm texture that is not mealy or mushy like red delicious apples. They also have a naturally sweeter flavor. If you want an even firmer apple with a more tart and less sweet flavor you can use green apples like granny smith. 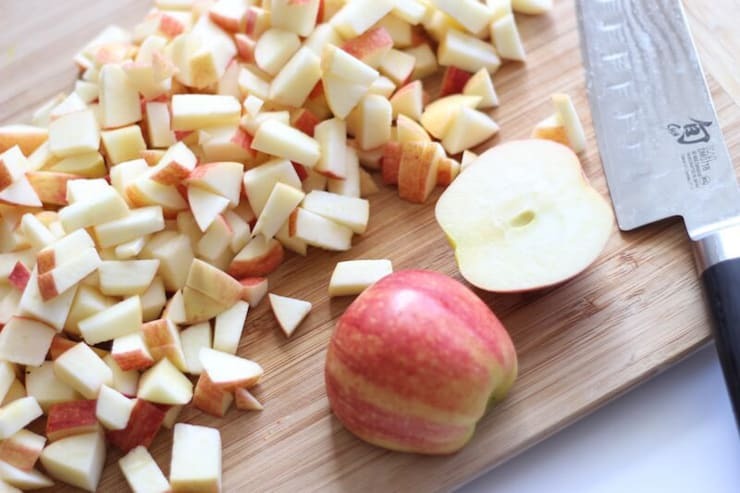 Be sure to dice the apples into even small even pieces so they cook through evenly in the oven. It helps to soften or melt the coconut oil when combining it with the diced apples so it mixes with it easier. You can substitute the almond flour for another nut flour like hazelnut flour, pecan flour or cashew flour, but it won’t work with other types of paleo flours. 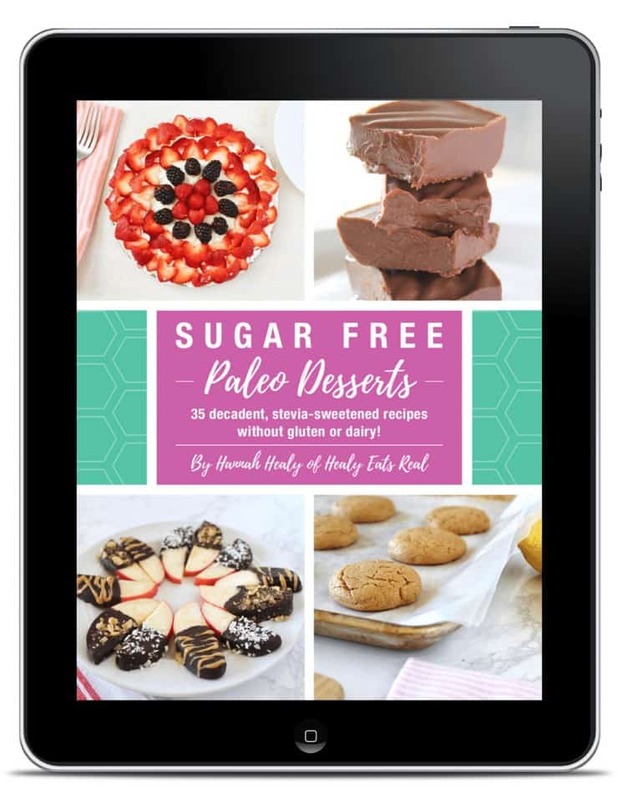 To make this recipe sugar free you can substitute the coconut sugar for granulated golden monk fruit sweetener. It will also work with regular granulated white monk fruit sweetener or swerve, but it works best with the golden variety. Store any leftovers in the refrigerator. It will last about a week. Pre-heat the oven to 350°. Then, dice the apples into small chunks. Warm or melt the coconut oil. 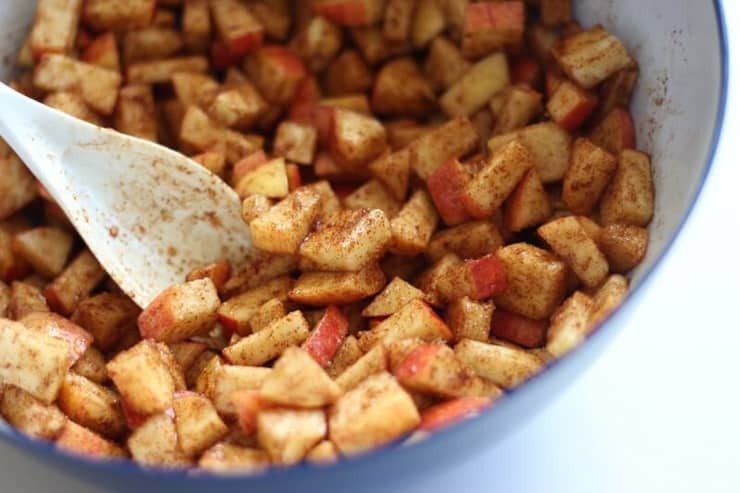 Combine the diced apples in a bowl with the remaining filling ingredients including coconut oil, cinnamon, clove, coconut sugar and lemon juice. In a separate bowl mix together the topping ingredients including almond flour, almonds, cinnamon, coconut oil and coconut sugar. Keep the coconut oil softened to room temperature to make it a bit pliable, but not melted. Pour the apple mixture into a pie dish or casserole dish, then top evenly with the crumble topping mixture. Bake for 30 minutes until the topping starts to become golden brown. Cool for five minutes before serving. 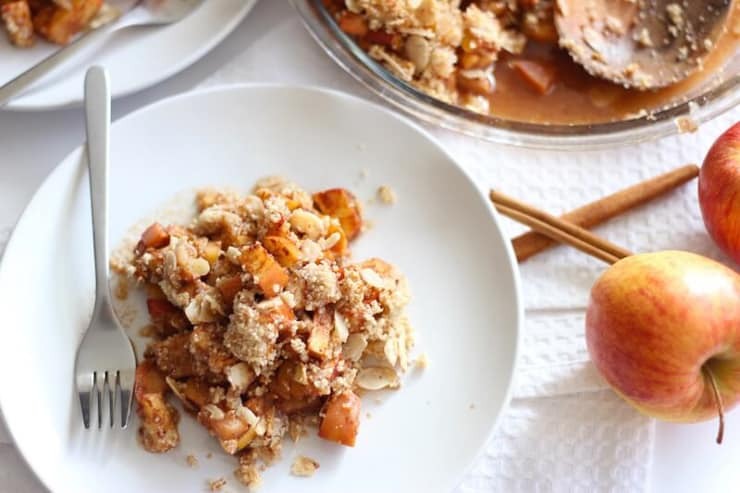 Did you like Delicious Paleo Apple Crisp (Vegan & Gluten Free)? Don’t forget to rate the recipe and leave me a comment below. You can also follow me on Facebook, Instagram, Pinterest! Preheat oven to 350F. Dice the apples in to small even chunks. For the crumble topping, make sure that the coconut oil is solid but soft (but not melted). In a medium mixing bowl, combine all crumble ingredients and stir together until a crumbly texture is achieved. Pour the apple filling mixture into the pie dish, and spread out evenly. 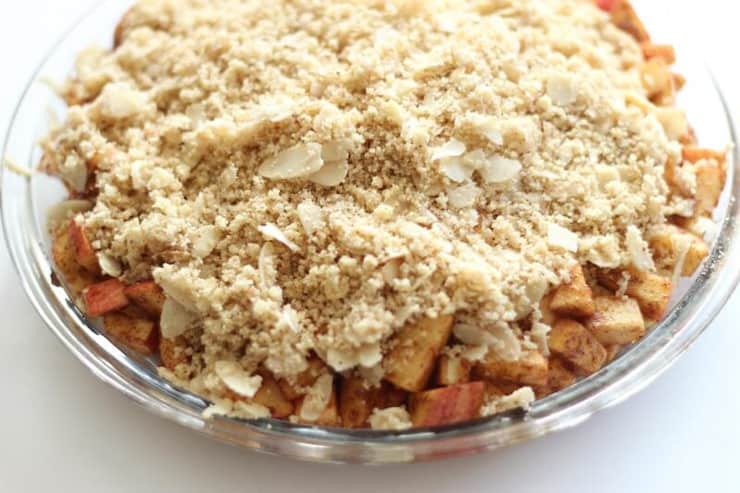 Distribute crumble topping over the apples. Bake for 30 minutes until the topping starts to become golden brown. Remove from oven and let cool about 5 minutes before serving. 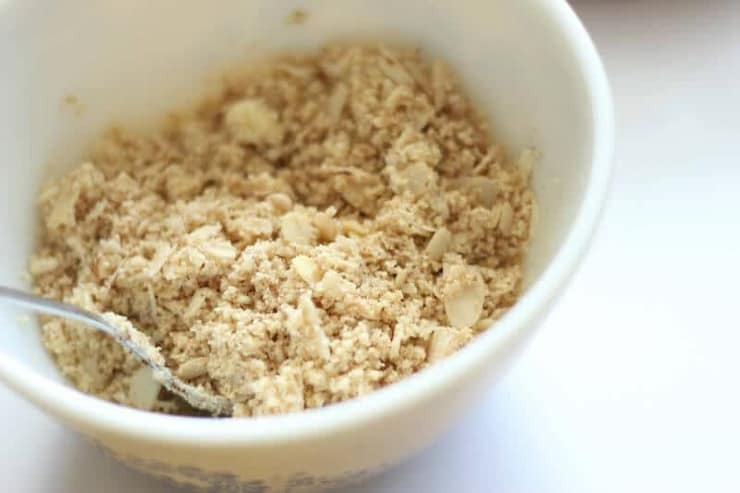 You can substitute the almond flour for another nut flour like hazelnut flour, pecan flour or cashew flour, but it won't work with other types of paleo flours. Nutrition facts below are for one serving of the paleo apple crisp recipe made with coconut sugar. 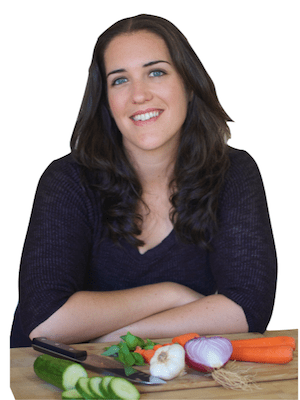 Ashley Sauvé is the Toronto-based Certified Nutritionist and Wellness Chef behind AshleySauvé Health. 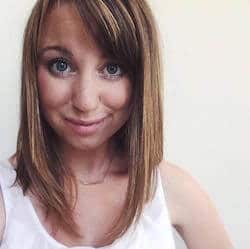 Her areas of expertise include: women’s health and hormone balancing diets, eating for autoimmunity, anti-inflammatory diets, gluten-free living, elimination/hypoallergenic diets, weight loss and metabolic balance, eating for energy and immunity and ancestral nutrition. I do love a hearty bowl of apple crisp this time of year! Proper autumnal comfort food, this! This looks warm and heartening and delicious! I especially love that it is a vegan recipe. Cheers! We love an apple crisp this time of year. With loads of custard on top! Apple crisp is one of my favorite desserts ever. I’ve never tried it this way though, I’m totally going to try this! This is the perfect autumn dessert! It’s exactly the kind of thing I need to make after a big Sunday roast as the weather gets colder. Definitely! I love these warm seasonal desserts this time of year!